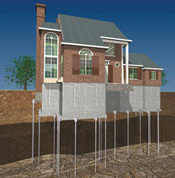 Pre-construction piers provide stabilization for the foundation of a structure before the building is built. Usually, pre-construction piers are helical piers designed to be driven with precision deep into the ground until they rest soundly upon the underlying load-bearing strata. How do Pre-Construction Piers Prevent Foundation Repairs? protecting your new home investment. stopping cosmetic damage as a result of settlement issues. Arrow, Bixby, Glenpool, Sand Springs, and Jenks. How are Pre-Construction Piers Installed? The piers are installed at various points around the foundation and are distributed evenly along exterior walls, corners, and on load-bearing walls. Each pier is hydraulically torqued into the ground and is load tested during the installation. Pre-construction piers can be installed in any soil, and the process typically takes 1-3 days, depending on the size of the project. This is one of the first phases that construction workers perform on a building after the site has been prepared and the footprint determined. Only after the pre-construction pier placement has been completed will the actual laying of the foundation take place. Piers are capped with brackets and integrated into the foundation using rebar and poured concrete, which is vital to the foundation repair process. Get Your Free Pre-Construction Pier Estimate Today!